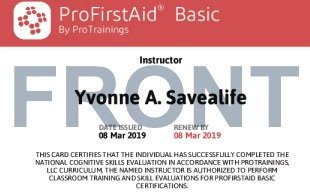 This course will train you on how to be an instructor for Lay Rescuer Adult CPR/AED and First Aid Upon completion of this course, you will be able to teach classroom courses and do skill evaluations for ProTrainings Adult CPR & First Aid and ProBloodborne courses. 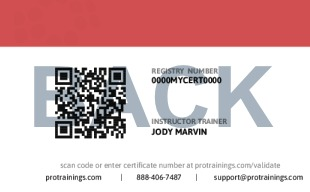 Please note, you MUST show proof of completion of a provider level Adult CPR/First certification or complete your provider level training at ProFirstAid Basic. This instructor training is for those who work mostly with general workplace professionals who work ONLY with adults. This instructor training is best for in-house instructors who want to train co-workers to be first aid providers to meet OSHA requirements. Total course time includes 1 hour and 12 minutes of video training as well as knowledge reviews, final test, remedial help and reviewing downloaded material.